Children on the island of Bangka in Indonesia receive free goggles in a bid by the maritime affairs minister to engage them early in caring for endangered reefs. It’s never too early to get children interested in nature. And anyone who has contact with young children can help provide experiences that will one day make them want to protect the environment. I’m sure reader Will McM. does that in his Making Music Together classes, and I know my kids and their spouses do that. Meanwhile across the world, a maritime affairs minister sees hope in her country’s very youngest. Kate Lamb reports for the Guardian, “Indonesia’s maritime affairs minister has come up with an unconventional way to help preserve precious reefs from marine pollution: distribute boatloads of free goggles to children in the archipelago’s remote coastal regions. “An avid snorkeler who is known for blowing up illegal fishing boats, minister Susi Pudijastuti said she wanted to give the next generation of Indonesians ‘the eyes’ to fully appreciate their marine environment. “During visits to Indonesia’s remote eastern areas, home to the ‘Coral Triangle’ and some of the most diverse marine life in the world, the minister said she noticed Indonesian children watching tourists snorkelling for hours, not fully understanding what they were doing. “Susi said she was angered when she saw plastic ‘at the beach, on the shore, on the reef, everywhere,’ and took measures to reduce usage in her own ministry. Single-use plastic is banned at Indonesia’s maritime affairs and fisheries ministry, and at all its ministerial events. “Susi told the Guardian she looked forward to the day when Indonesia could ban single-use plastic altogether.” More at the Guardian, here. Speaking of single-use plastic, I have recently learned that straws are dangerous to sea turtles and intend to stop using them. But recently at an earthy-crunchy juice bar, plastic straws were all they had. Disappointing. Everyone needs to do their bit. Indonesian students on the island of Belitung receive free goggles. I wanted to share a post from a young blogger in Indonesia who wrote not long ago about her father’s work to clean up a river. The blog is Safira’s Journey. Safira writes that her father is retired from the civil service. He had a high position, she says, but he refused to take bribes. Her dad’s involvement in the Rubbish Bank, a waste and recycling organization, flows from his dream of making the river near their home clean again. The organization sells people’s usable castaways and turns household garbage into fertilizer for organic plants. The Rubbish Bank sells the fertilizer to farmers and encourages villagers to make their own. Safira’s father and his team made a special tool for turning kitchen scraps into fertilizer, and they provide the tool to interested families. “The people will get the money once in a year,” Safira says. “My dad is very active in it. He helps and works a lot. Safira admits that the warung hasn’t always worked as well as hoped. She says that negative people made trouble, suspicious that only her dad would benefit. “It’s common here, where we want to help or to do some good things. People will think negatively. “My dad cleans the environment around our village especially for the river. He wants to clean the river as he has a dream to make the river clean and clear like he has seen before when he was a kid. He is also an initiator for water pump by using liquid propane gas. So, the farmer can save the budget about 50% to maintain their farming field. It’s good idea for irrigation. “I’m happy if my village is clean and healthy. I’m very proud of my dad who works hard to give example for the people around him. He becomes an advisor for some environment activities. I hope our government will help him someday to spread his goals to make Indonesia green and clean from rubbish.” More here. Safira’s Journey is a great website, by the way, full of interesting stories about her village and its environs, with lots of pictures. I’ve read about book lovers delivering books to children and adults by camel, donkey, portable Uni bookshelf and van. Now at the BBC, Theodora Sutcliffe reports on a sailboat that can get books to watery places in Indonesia. “The toothless steersman positioned the rudder. A second sailor, balancing barefoot on an outrigger, coaxed an elderly engine into life. A third poled the boat away from the trash-strewn beach. In West Sulawesi, Indonesia, a ground-breaking mobile library was on its way. “The Perahu Pustaka (Book Boat) is sorely needed. In a recent study of 61 nations for which data was available, Indonesia ranked second worst for literacy – only Botswana scored lower. More than 10% of the West Sulawesi’s adult population cannot read, while in many villages, the only book available is a solitary copy of the Quran. “As we closed in on the oyster-farming village of Mampie on the West Sulawesi coast, a gaggle of children emerged from the palms to watch the library boat pull in. Others stopped the hard, repetitive work of shucking oysters as Alimuddin, a volunteer from his home village and his crew of three unrolled plastic mats and covered them in books. “Excited children dived into the brightly coloured tomes; their mothers, some with babies, were more circumspect. “ ‘When you see a child smile and open a book, all your problems disappear,’ Alimuddin said with a smile of his own.” More here. In 2015, Alimuddin decided to combine his twin passions for books and boats by setting up a mobile library. Are you familiar with the “Lens” blog at the NY Times? It focuses on “photography, video and visual journalism.” Here David Gonzalez writes about the photos of Putu Sayoga. “If you live in a far-off place, a library may be something you’d only read about in books. That is, if you had books to begin with. “That became the mission of Ridwan Sururi, an Indonesian man with a plan — and a horse. 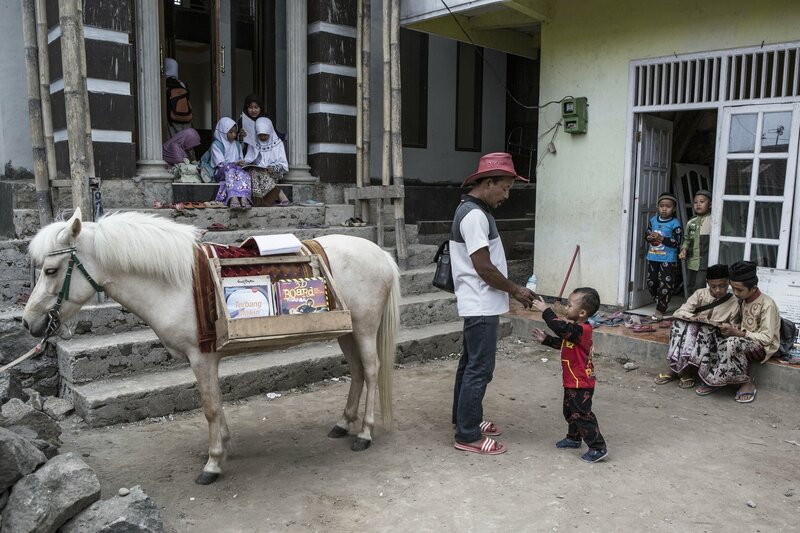 Several days a week, he loads books onto makeshift shelves he drapes over his steed, taking them to eager schoolchildren in the remote village of Serang, in central Java. ..
“Mr. Sururi made a living caring for horses, as well as giving scenic tours on horseback. One of his clients, Nirwan Arsuka, came up with the book idea as a way of doing something to benefit the community, specifically a mobile library. He gave Mr. Sururi 138 books for starters. Most were in Indonesian, and the books included a lot with drawings. “Children at the schools he visits can borrow the books for three days, and demand has been so great that he now has thousands of books.” More here. Check out the slide show. At Moth Radio Hour, people who can tell stories well are recorded telling theirs before an audience, without notes or prompts. I was driving home one day when I heard a story by Jensi Sartin, who showed fishermen in Bali how to save their livelihoods by “banking” some fish. A bit of background on Sartin comes from the Aspen Ideas blog: “Jensi Sartin is the director of the Reef Check Foundation Indonesia in Bali, where he devises community-based strategies to protect the coral reefs in Indonesia. [In] his story ‘The Fish Bank,’ [he talks] about how he tried to bring the fish back to Bali. “Sartin says community-based conservation forms a crucial part of sustainable development, especially in regions of the world that are environmentally stressed.” Here is the Aspen link. If you missed my review of the climate-change movie Revolution, which shows how coral reefs are sending us a warning, check it out here. And you can listen to Sartin’s inspiring storytelling at Moth. On the Moth Radio Hour, Jensi Sartin talks about creating a fish bank.